The New York Red Bulls have completed the transfer of U-19 Denmark National Team forward Mathias Jorgensen from Odense Boldklub using Targeted Allocation Money, and signed him to a multi-year MLS contract. Jorgensen, 18, will be added to the roster pending receipt of his ITC and P-1 Visa, becoming New York's youngest rostered first-team player in 2019. Additional details of the transfer and contract were not disclosed. Jorgensen, 18, made his professional debut for Odense Boldklub's first team at 17. The Hundested native has appeared in 18 matches across all competitions and tallied three goals in 572 minutes. Before he was promoted to the first team, the Danish forward played for OB's U-19 side, appearing in 25 matches and scoring 28 times in 2,112 minutes played. He also scored nine goals in nine games for the OB reserves. For country, Jorgensen has seen time with both Denmark's U-18 and U-19 squads. He made his first appearance for the U-18 team on Nov. 9, 2017 against the Czech Republic U-18s in an international friendly. 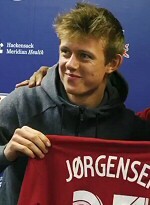 Jorgensen then made his debut for the U-19 side on March 25, 2018 against Germany's U-19s. In total, he has appeared in five matches with 260 minutes played for Denmark. "I'm so much looking forward to being a part of the New York Red Bulls," said Jorgensen. "I will do whatever it takes to achieve success together with my new teammates."